Since When Is It Not Okay to Play Hardball With the Democrats? The real issue in the fight for single-payer health care in California is not cost—it is political will and political priorities. Despite efforts by the political establishment to shut it down, the quest for a state-based, Medicare-for-all type system in California, based on patient need, not corporate profits, rolls on. After SB 562 passed the California Senate in early June, California Assembly Speaker Anthony Rendon unilaterally blocked the bill from advancing before a single hearing could be held or a single amendment could be considered. 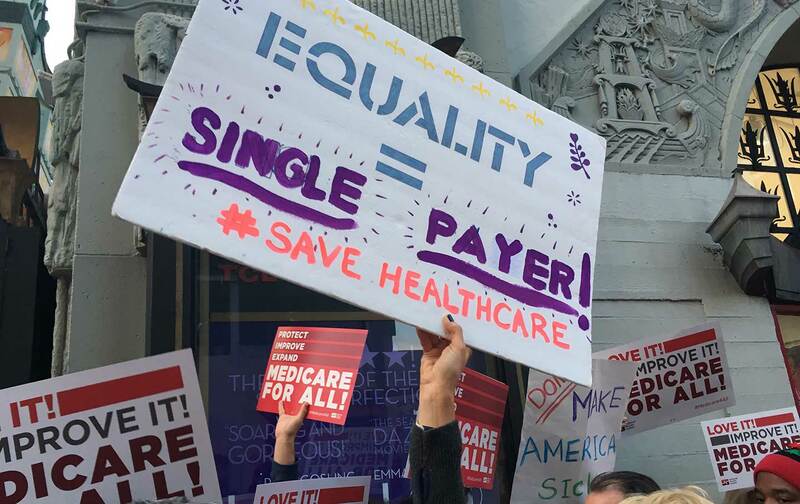 Nurses, the lead sponsors of the bill, and thousands of health-care and community activists who have organized and mobilized in support of SB 562, responded with multiple protests at the State Capitol, canvassing and hosting a town-hall meeting in Rendon’s Los Angeles–area district, and flooding social media in protest. They are far from done. Activists will work to hold every member of the California Assembly accountable, insisting all sign on as co-sponsors of the bill and declare whether they agree that insurance companies should be the determinants of our health. They are also reminding Rendon that there is still time to move the bill in a legislative session that does not end until mid-September. With Rendon claiming he acted because the bill is “woefully inadequate,” many have wondered what the job is of elected representatives if not to hold hearings and make amendments to legislation they think need changes. Corporate-media critics have been quick to inflate the projected cost of a system to guarantee health care for all Californians, with real patient choice, and no premiums, deductibles, or co-pays that reinforce an inequitable system based on ability to pay. But economist Robert Pollin, lead author of a study on the potential costs, recently wrote that the bill “could deliver decent health care to all 39 million California residents while also lowering overall costs of health care by about 8 percent relative to the existing system.” Under Pollin’s recommended approach, virtually every California household and business would spend less on health care than they do today. The real issue is not cost—it is political will and political priorities. Will state legislators be accountable to the 40 percent of the state’s population who remain without any coverage or with out-of-pocket costs so high they face financial stress or ruin if they seek to get care? The seminal fight for SB 562 also reflects a national struggle for the movement for social change in the United States. In a decade in which Democrats have lost 1,000 national and state elections under the umbrella of a status-quo leadership that remains more responsive to Wall Street, K Street, and Silicon Valley than to its grassroots base, the battle for single payer/Medicare for All takes on added significance. A recent national poll shows that 60 percent of Americans believe “it is the federal government’s responsibility to make sure all Americans have health coverage.” The question remains: Will those who control the Democratic Party believe that “resistance” to Trump is enough to win lost voters, or do they need to actively promote real populist reforms, like Medicare for All? Opponents of SB 562, from the inner circle of the Democratic Party to their allies in the mainstream, and even some in the liberal or supposed progressive media, have cited the pretext that we must wait while fighting the threat of repeal of Obamacare, falsely characterized some components of the bill even as amendments are blocked by Speaker Rendon, or denounced assertive tactics of the campaign by supporters to pass the bill. We can draw lessons from the words of Dr. King, during the great civil-rights movement, written from solitary confinement in a dismal Birmingham jail cell in 1963. Dr. King chastised the “white moderates” who, with their criticism of direct nonviolent action and greater devotion to “order” than to justice, often posed a greater “stumbling block” to the “stride toward freedom” than the most virulent opponents in their path. RoseAnn DeMoroRoseAnn DeMoro is executive director of the 175,000-member National Nurses United, the nation’s largest union and professional association of nurses. Hedge-Fund Ownership Cost Sears Workers Their Jobs. Now They're Fighting Back.